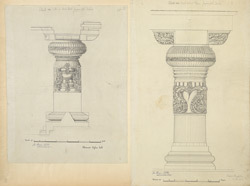 Illustration of pillars from Jagannatha Sabha, Cave XXXIII, at Ellora from James Burgess' 'Original Drawings [of] Elura Cave Temples Brahmanical and Jaina, IIII.' The spectacular site of Ellora is famous for its series of Hindu, Buddhist and Jain cave temples excavated into the rocky façade of a cliff of basalt. The works were done under the patronage of the Kalachuri, the Chalukya and the Rashtrakuta dynasties between the 6th and the 9th Centuries. Jagannatha Sabha is one of a group of five Jain caves dating to the 9th Century excavated under Rashtrakuta patronage to the north of the site. The façade of this red granite rock cave consists of an architrave supported by heavy columns with cushion capitals and ridged shafts with animal brackets. Illustrated on left is a pillar from the lower hall and on right a pillar from the back central part of the cave.